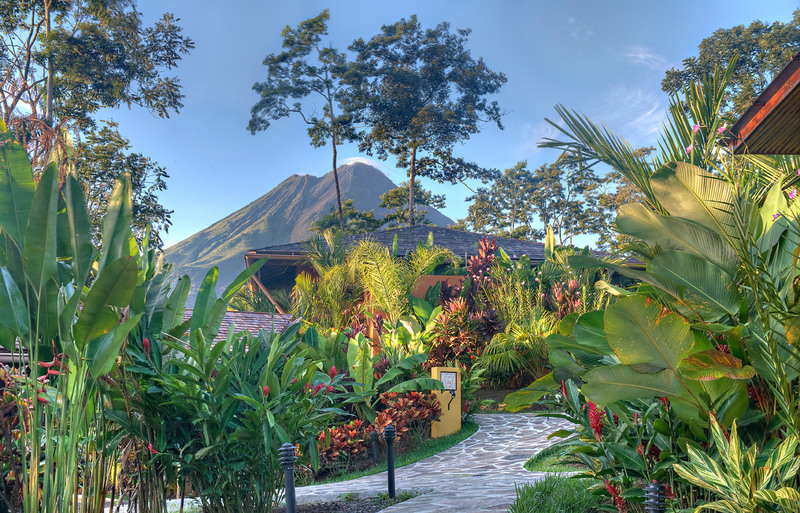 Nayara Springs sits in the shadow of the Arenal Volcano, which dominates the skyline. Nayara Spring specializes in seclusion. 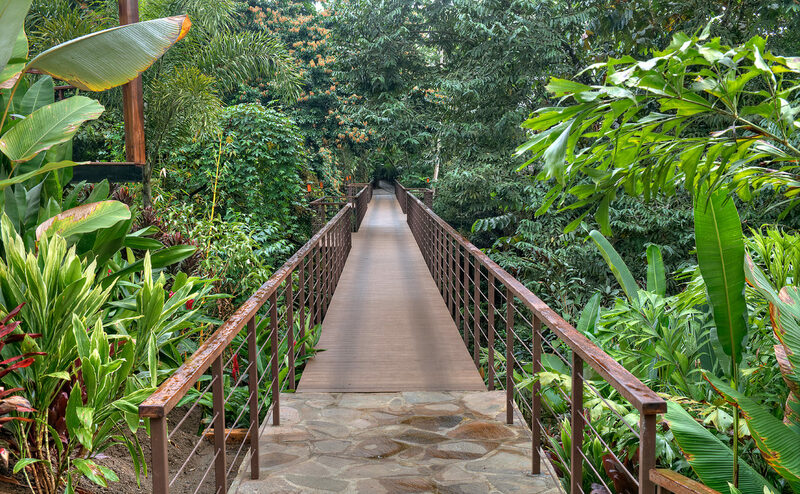 Stone pathways meander through landscaping that explodes with heliconia, orchids, and red ginger plants. 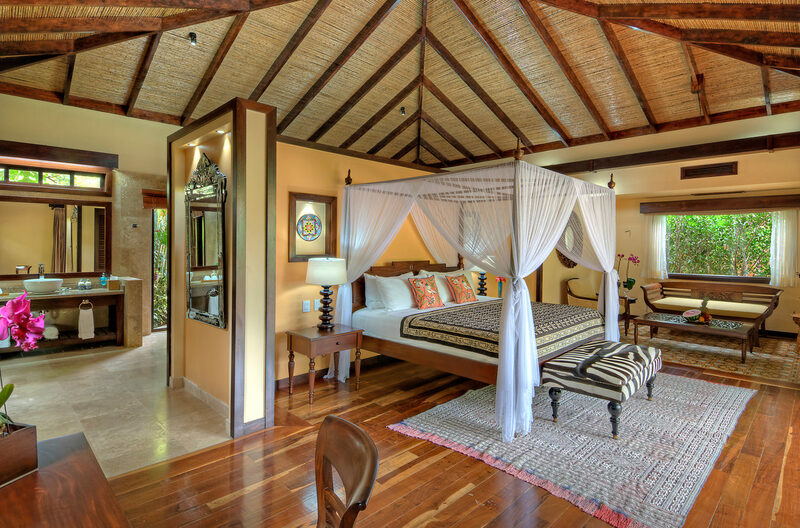 The four-poster king bed is the centrepiece in each of the 35 Nayara Springs teak-and-stone villas. Every Nayara Springs villa has a private plunge pool drawing on mineral-rich spring water from the volcano. The 67-metre long pedestrian (and golf carts) bridge leads to Nayara Springs and spans a thickly wooded ravine and creek. 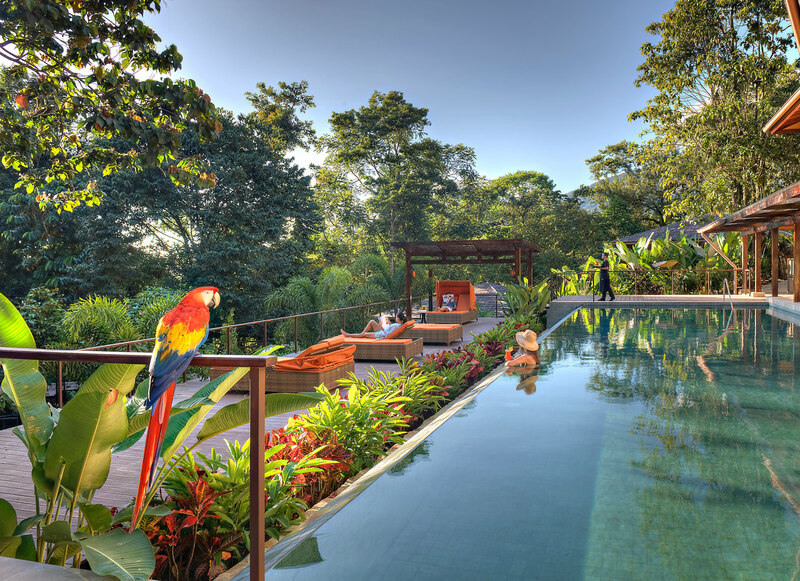 There are two common-area pools at Nayara Springs (lap and lounging) along with over 500 species of birds. 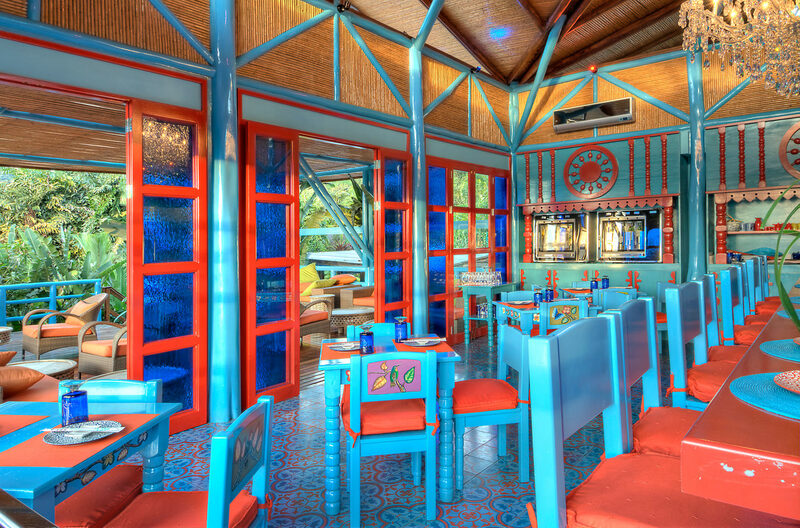 Asia Luna is one of five restaurants at Nayara Springs; the décor resembles a Pulperia, a typical Costa Rican bar. Costa Rica is a sliver of a country sandwiched between Panama and Nicaragua, with the Caribbean Sea and the Pacific Ocean lapping at its shores. In 1948, the country abolished its military and began pouring money into conservation; by the 1980s, Costa Ricans—Ticos—were declaring vast segments of their country protected nature reserves. With 0.03 per cent of the Earth’s land mass, but 5 per cent of its biodiversity, Costa Rica was “green” before the term even existed. By the mid-1990s, when ecotourism became travel’s “it” term, the country was a ready-made paradise. Birders, biologists, botanists, and adventure sports enthusiasts have been flooding in ever since. And yet, one thing has long been missing: style. “There are a lot of luxury hotels in the world,” says Leo Ghitis, owner and property developer of Nayara Springs, “but not in Costa Rica.” And so the Miami-based and Colombian-born Ghitis, along with his cousin-in-law, hotel designer Angelo Zaragovia, set out to build luxury accommodation in the Costa Rican rainforest. There is a sense of nostalgia with this project: “Costa Rica looks just like Colombia, without all the problems,” says Ghitis, who fell in love with the country on his first visit while vacationing with his family. Nayara Springs opened in December 2013 with 16 villas as an adults-only annex to the Nayara Resort, Spa & Gardens. 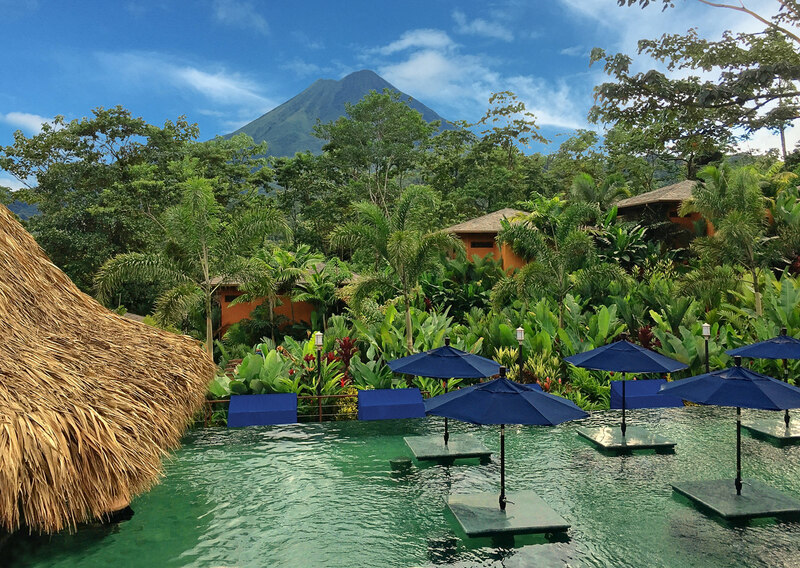 Set under the jungle canopy, the peaceful Nayara Springs sits in the shadow of the Arenal Volcano, which soars 1,633 metres high and dominates the skyline. While it was once the most active volcano in Costa Rica, now the quiet landmark provides a constant reminder of the contrasting beauty and the power of nature. Today, the 35 spacious (1,500-square-foot) teak-and-stone villas surrounded by tropical plants look out on the rainforest, with indoor and outdoor showers, polished wooden floors, and four-poster king beds. Each villa comes with its own plunge pool, drawing on mineral-rich spring water from the volcano. There are over 500 species of birds in the area and they practically make house calls: hummingbirds on your patio, parrots while you’re lounging in the common-area pool, and great kiskadees as you drift along the stone pathways through landscaping that explodes with heliconia, orchids, and red ginger plants. “We have 900 [species of] birds in Costa Rica,” says resident bird-watching guide Pablo Castillo. “Eight hundred and ninety-nine are beautiful ones, and we get the clay-coloured thrush as our national bird.” Valid point. “But listen to its chirping,” he says. “Enchanting.” The melody of birdsong at Nayara Springs is a rapturous rainbow of sound. Add to that the drumbeat of raindrops (after all, this is a rainforest) and you find yourself front row for nature’s orchestra. 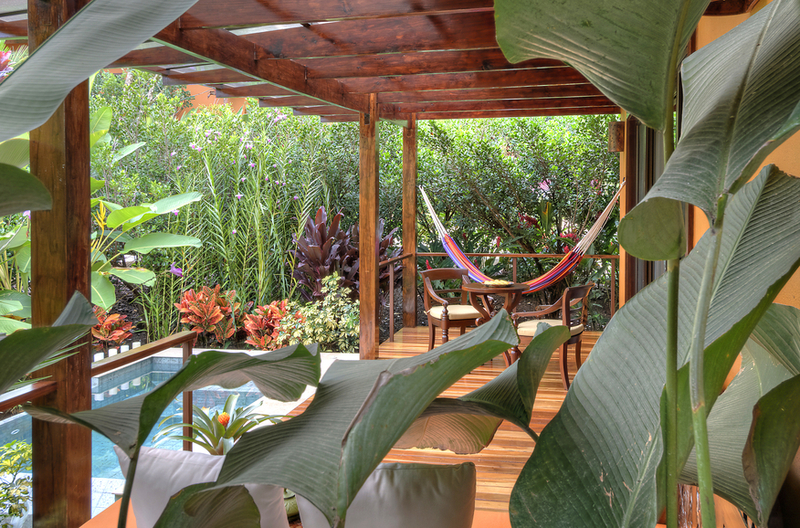 With its remote location halfway between capital city San José and the Nicaraguan border to the north, Nayara Springs specializes in seclusion. It’s tempting to never leave the property, which has open-air yoga and spa pavilions, two pools (lap and lounging), five restaurants with a range of cuisines, and even an espresso bar, Mi Cafecito (coffee is the second-largest commodity in the world, after oil, and Costa Rica is a dominant player in the industry), but the roster of activities off-property does entice (zip-lining was invented here).